I Harry Parkins was a Warrant Officer Flight Engineer on Lancaster and Lincoln bombers based at 50 Squadron RAF Waddington May 1947. The Lincoln bombers were a larger version of the Lancaster. We were gradually replacing the Lancaster with the Lincoln. One day whilst talking to a friendly Flight Sergeant photographer who used to (unofficially) develop and print our photos and snapshots I suggested to him it might be a good idea for him to fly with us in a Lancaster and for him to take a picture of a Lincoln flying over Lincoln Cathedral. He was dead keen on the idea as it meant a short flying trip for him, all of course highly unofficial. 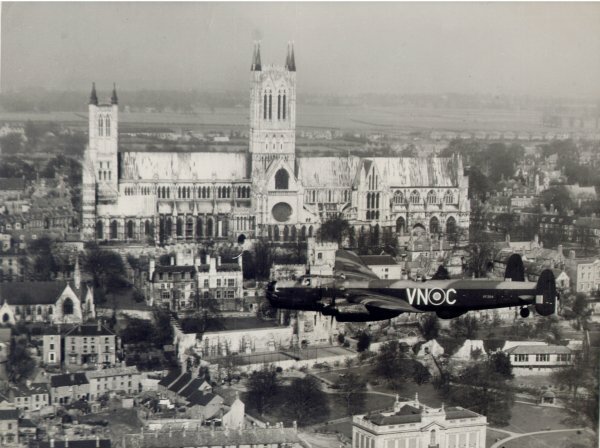 I got in touch with the pilot flying the Lincoln and agreed a time when he would be near the Cathedral and arranged with my pilot that we would rendezvous over the Cathedral by taking up our Lancaster for a test flight with the photographer on board. Unfortunately, the Lincoln pilot flew below the Cathedral as we arrived. Needless to say our photographer captured the moment. When we landed I went with the photographer to the photographic section to see the photo developed. He put two photos on the heating drum. At that moment, as we were waiting for the photos to come out, the Group Captain entered the room. Sensing something was amiss, he asked what we were up to. At that moment, the first picture came out of the drum. He picked it up, saw what it was and tore it to shreds. He then demanded that we hand over the negative. This too was torn to shreds. He said we were both very lucky not to be up on a charge, for if the pictures got out, he too would be in serious trouble for allowing a squadron plane to fly below the Cathedral. With that, he stormed out of the room, not seeing the second photo emerge from the drum. The Flight Sergeant was scared and said we should destroy the second photo. I said no, hid it under my battle dress and walked out. I kept the photo safely hidden for several years until one day I got chatting to the photographer on the local Lincolnshire Echo who had come to see me at work to ask me about my war service. During our conversation I mentioned the photograph and its history, how it had come to be taken, then rescued and hidden. He was very interested. He asked to see it and said if it was good enough he would like to see it printed in the Lincolnshire Echo . When I took him the picture, he was overwhelmed, saying it was a fantastic picture and that he would definitely get it published as a half page in the paper. A few days later he telephoned me to say it could not be printed. He had discussed it with the editor who had said no, as it would be covered by the RAF Secret Act for at least 25 years. We were both very disappointed. However he would put it in his diary for future use. 25 years later, the Echo photograph Ken James telephoned me to say, buy the Lincolnshire Echo and I would get a surprise. The picture took up half the front page! November 2008, the photograph was reproduced in Capturing Lincoln Cathedral , a collection of over one hundred photos of Lincoln Cathedral. Unfortunately the picture has an incorrect caption. It should read 'A Lincoln bomber flying below Lincoln Cathedral' not as printed in error 'A Lancaster from a Lincoln Bomber fly past, 1948'. The correct date was May 1947. Prior to publication the book had the working title of Capturing the Cathedral . When it was drawn to the attention of the person responsible for the book Cathedral fundraising officer Sally Crawford that the picture had an incorrect caption she tried to blame the the contributor. When asked to produce the original paperwork that accompanied the picture, the error was seen to be hers. And the picture was poorly reproduced, with the Lincoln bomber difficult to distinguish from the background. Somewhat belatedly Sally Crawford admitted that she had made a mistake but at least did have the good grace to apologise. 50 Squadron, Royal Flying Corps, was formed at Dover in Kent, on 15 May 1916, as a Home Defence squadron. The squadron first went into action in August 1916 against a German airship raid. During WWII it was based at RAF Waddington with Avro Lancasters. RAF Waddington is still an active RAF base. During the height of the Cold War Vulcan bombers were ready at a moment's notice to deliver nuclear weapons to targets in Russia. RAF Waddington is currently home to Nato AWACs and the latest strike aircraft the Typhoon.